well played Steven and Daniel……………. This week was a variation on the popular scramble, but this time only 2 in the team (minimum 7 drives each). Blue skies, but very cold for the 54 players. 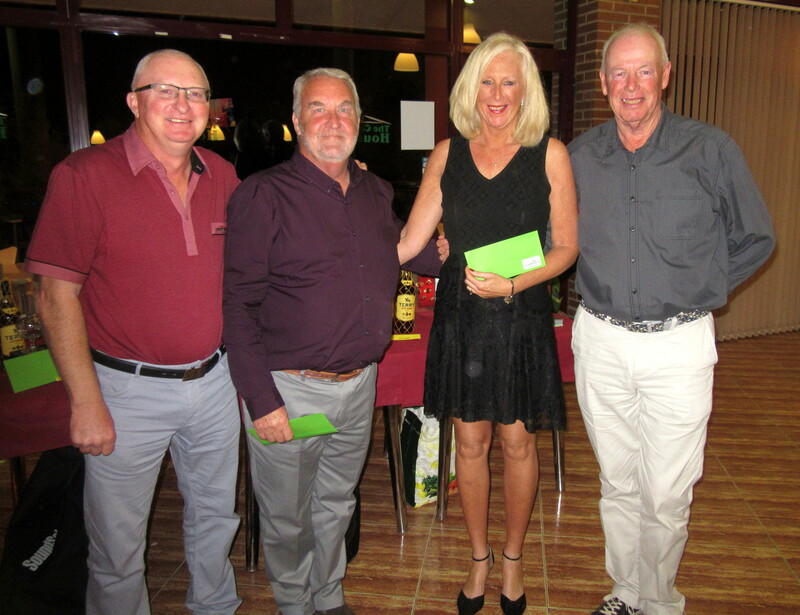 Sadly 2 players did not arrive, spoiling the day for their partners who had already paid their green fee but were unable to play in the competition. Still awaiting a reason for their absence, and without that access to the masterscoreboard functions will be denied for a limited period. Thanks to Kerry Henry for acting as starter again today. Higher scoring compared to the 4 person equivalent which needs sub 60 scores to have a chance. I didn’t get further onto the course than the 18th, so these will have to do. 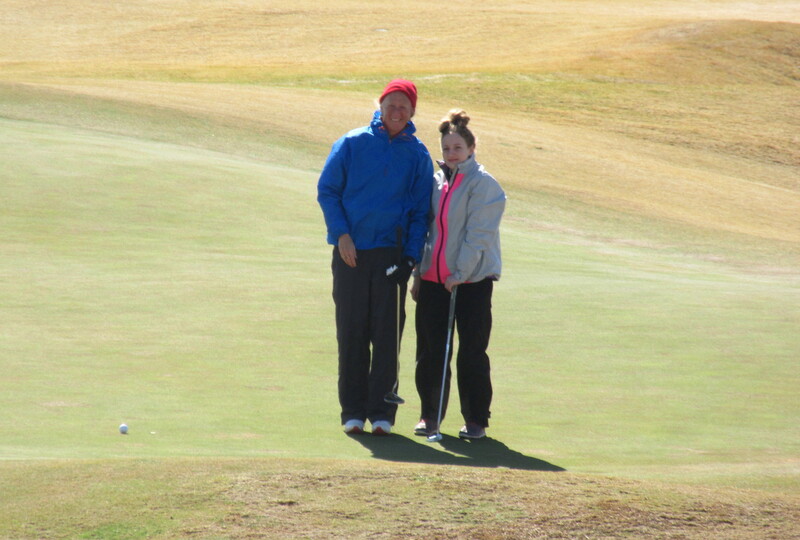 Megan putts for birdie on 18………………. Just decided to experiment with video option. Managed to film it and edit the length and just by chance caught Ken’s mistake. He missed his approach putt, but then holed out instead of giving partner Phil a chance to beat his score! Next week is the 3rd Apollo Air individual stableford of 2018. 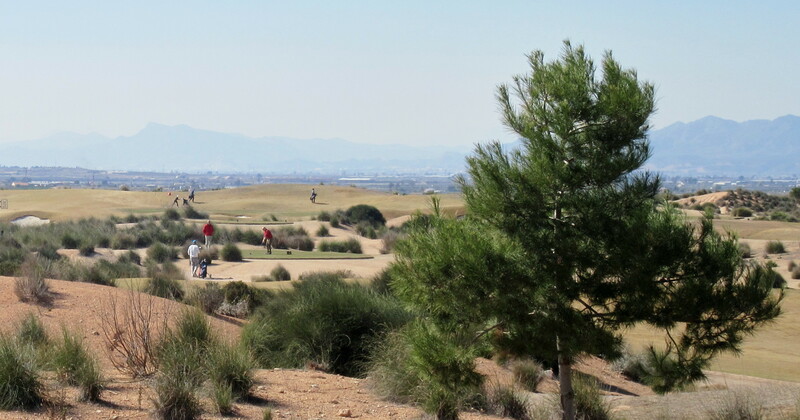 As part of the Los Amigos de Mazarron FC 9th Gala Week celebrations their will again be a Celebrity Golf Day at Camposol Club de Golf on Monday 26th March. Visiting celebrities taking part include former Manchester United goalkeeper Alex Stepney, England International Tony Currie and Comedian Gary Marshall. It is hoped that they will be joined by ex Charlton Athletic midfielder Peter Reeves and West Ham United and England central defender Alvin Martin. Last year a record number of 84 golfers took part in the Texas Scramble tournament and interest this year is already growing. In order to streamline the event and make it more manageable on the day the cost this year is €150 for a team of four. This includes green fees and a two course lunch immediately following the golf and is a slight increase on last year. 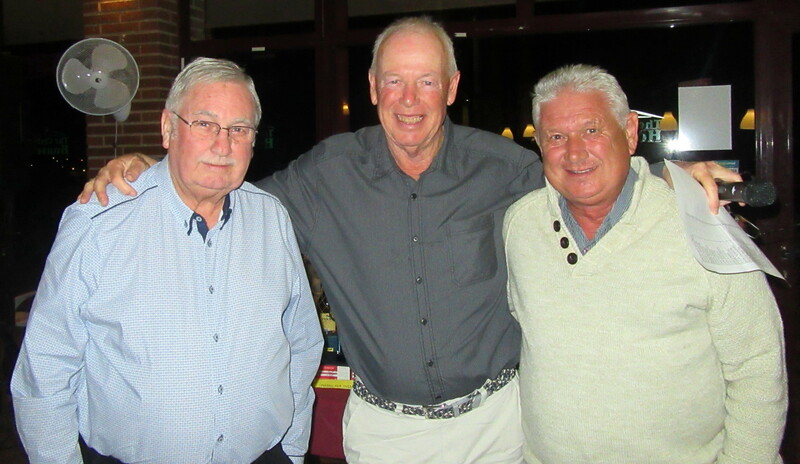 Individual golfers are also welcome and will be included in teams of four at a cost of €37.50 per person. Wifes and partners are welcome to book additional lunches and join their partners after the event also Bacon or sausage baps can be order pre golf at €3.00. A limited number of buggies will be available on a first come, first served basis at a cost of €20 per buggy. Thanks to Apollo Air for the sponsorship again…….. 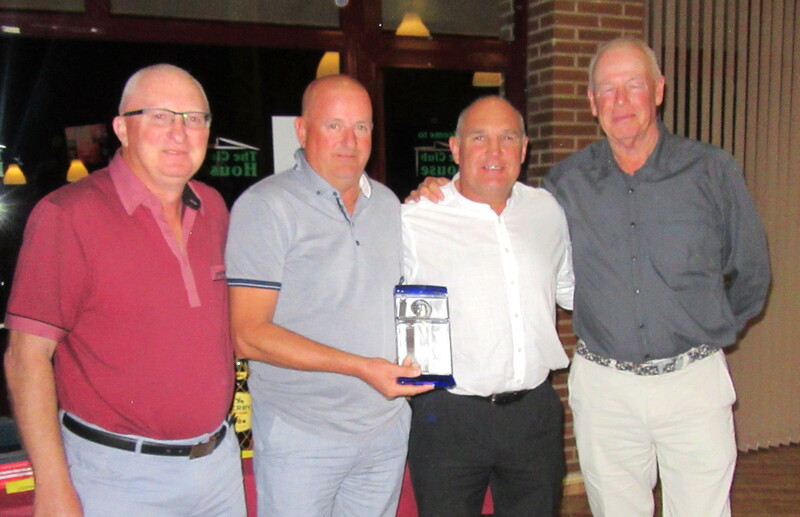 The second Apollo Air of 2018 attracted 43 players who had perfect playing conditions – however, only two managed to better par. The average scores were much better though, with many more in the 30’s than last week. 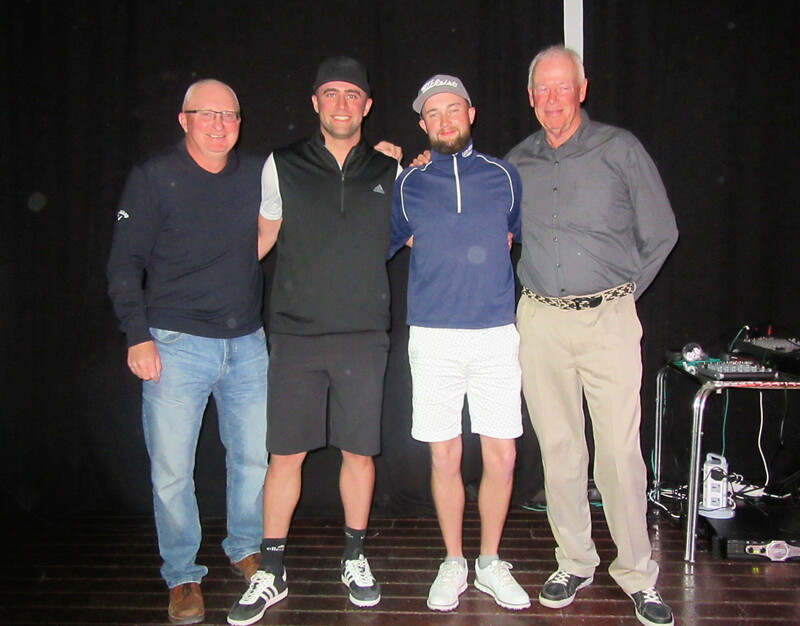 This month’s winner was Dave Rollett, who has never won a major or special event but this was his time. Phil Cooke won division 2, and has taken the overall lead in the annual Apollo championship after 2 qualifiers (5 to count). See ‘best of series’ tab at the bottom of this week’s results on masterscoreboard for full information. 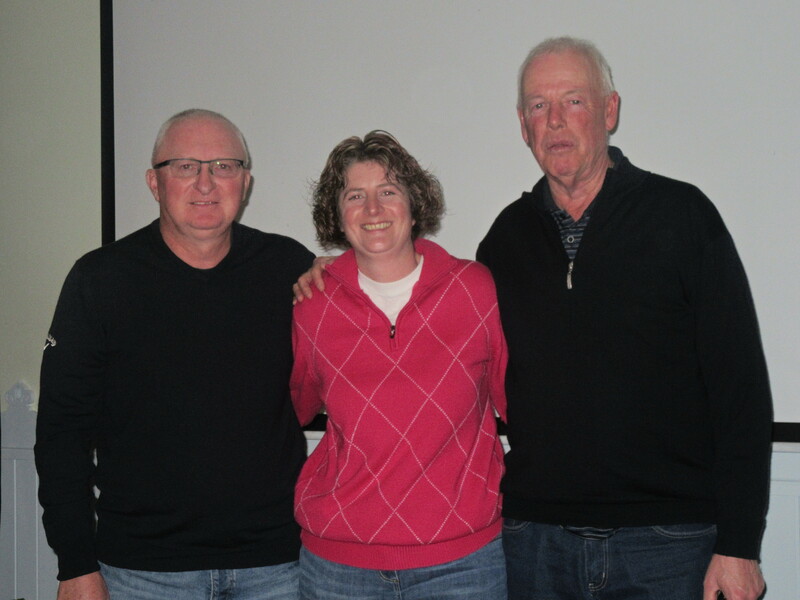 Thanks to Lyn Bell who covered the starter’s duties this week. 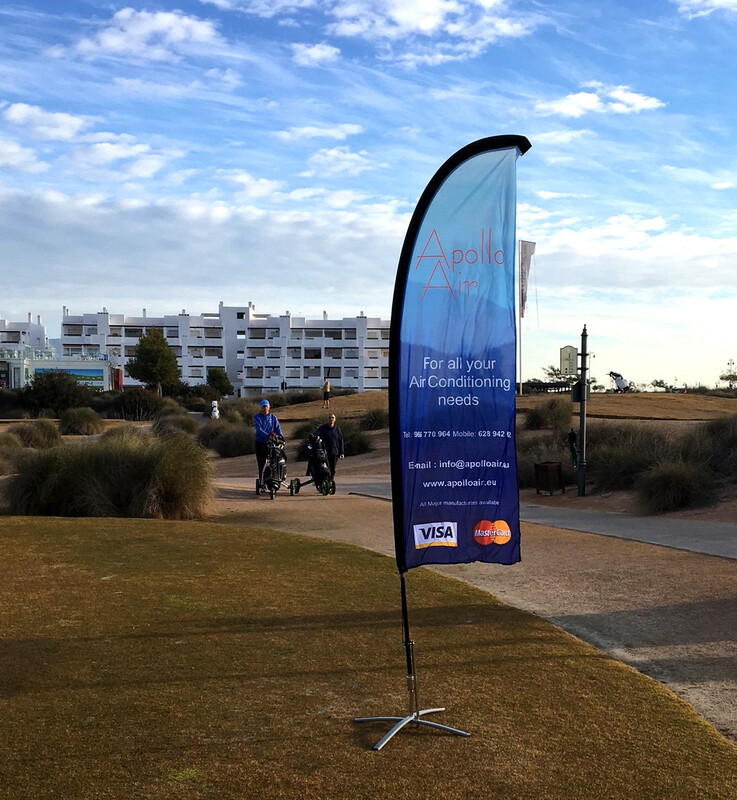 I am not playing for several months, so thanks to Phil Cooke for the photo of the Apollo banner on the first tee. Any photos or comments on the golf will be welcome to add a little interest to the forthcoming blogs – send to me at barry@cdagolf.com on Friday or Saturday for possible inclusion. Dave proudly holds his first trophy……………. 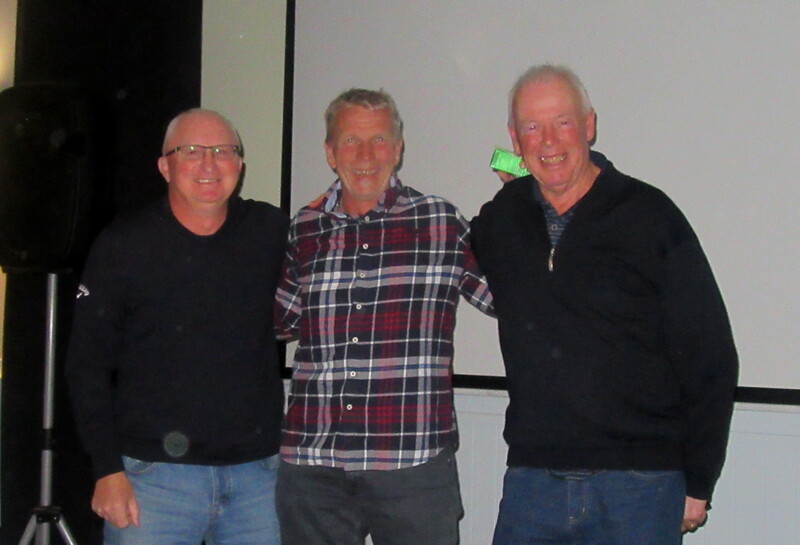 Borre escaped the snowy conditions in Norway to win division one……………..
Vice-captain Phil didn’t have far to go to collect his division 2 prize (he was already on the stage!)………………….. 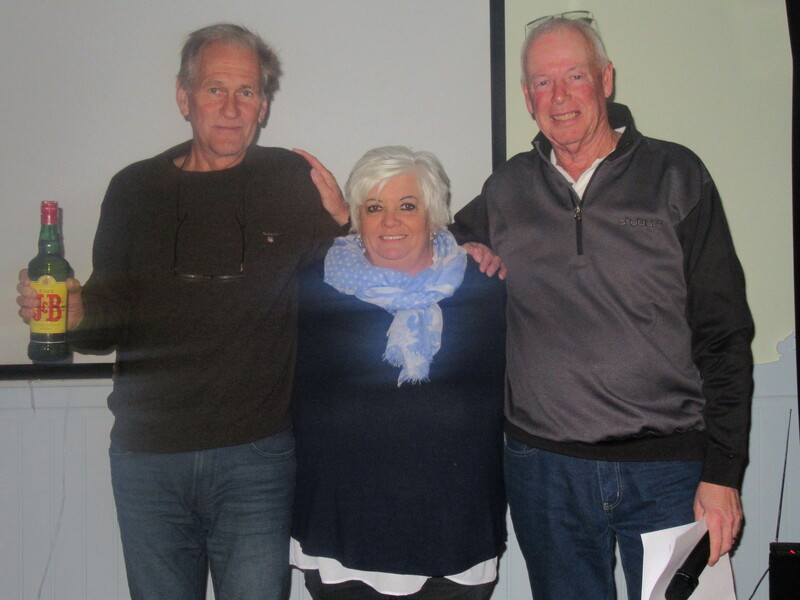 Fran is back and in the prizes again……………. Next Wednesday is the last date for committee membership applications, and any proposals to be discussed at the AGM on March 7th (7 p.m. at the Skye bar). 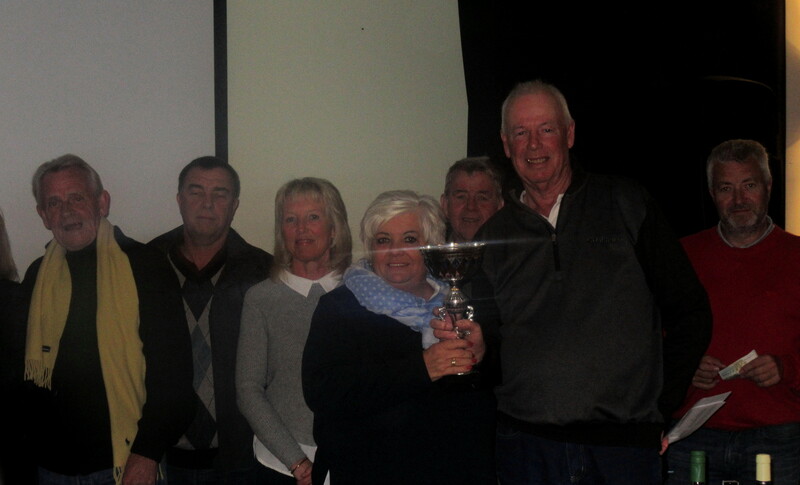 President Neil had pressing business at the community AGM so wife Lynn presents the trophy……. 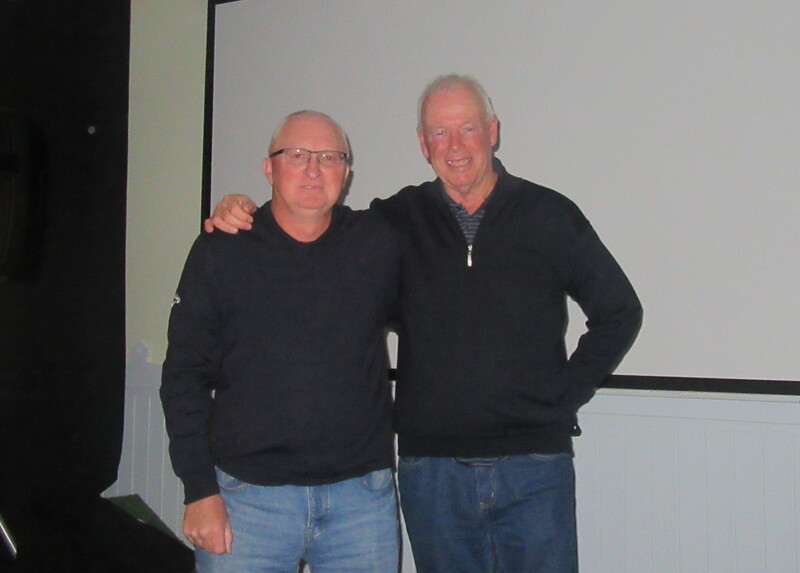 This week was a challenge between the captain’s team (Ken Saunders) and the president’s team (Neil Simpson). 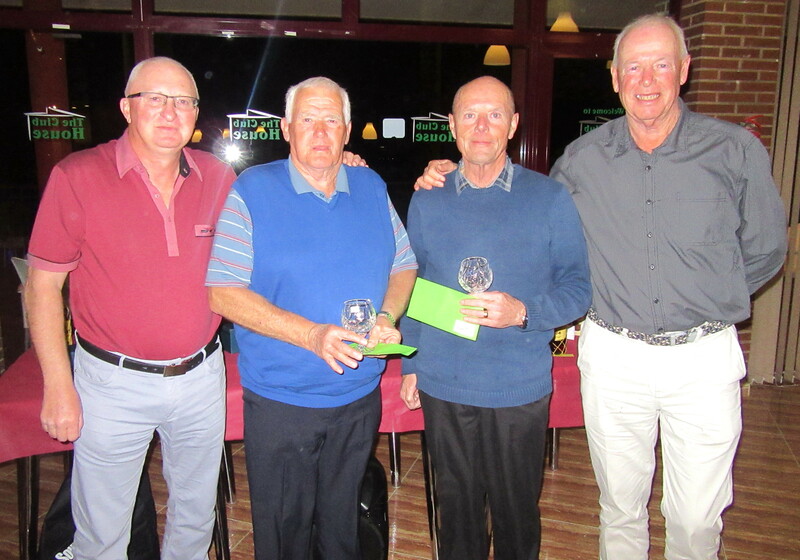 A change to last year’s format, this time a singles stableford (all players to count), with Ken’s team coming out victorious. The teams were drawn out. 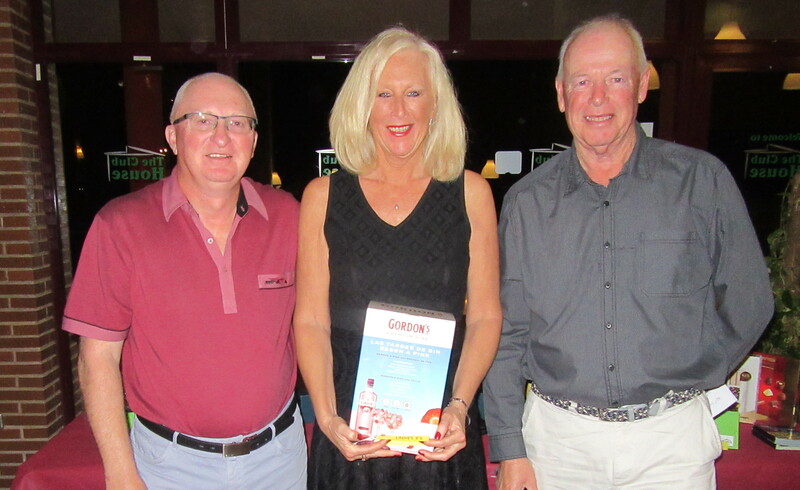 and a singles stableford competition was included. 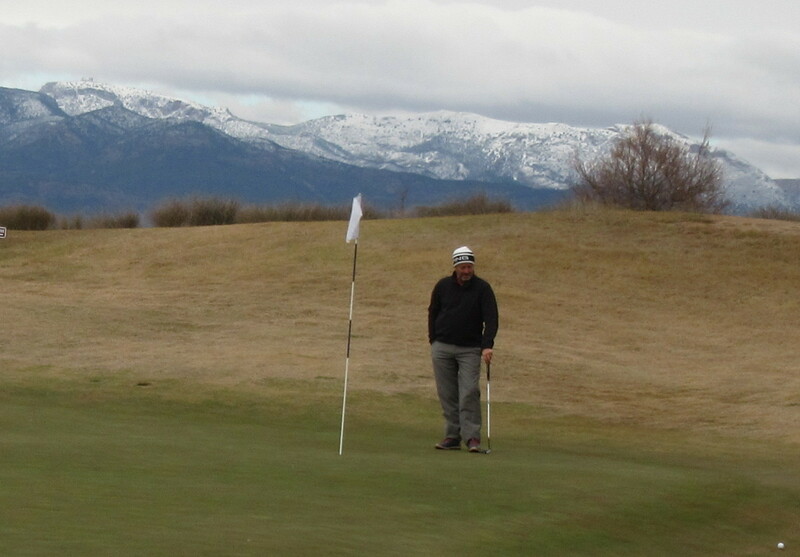 Although it was a little chilly, it was sunny with no obvious reason for poor scores, but that was the case with most players returning about 23 points. In fact, not one of the 52 players reached their buffer zone! 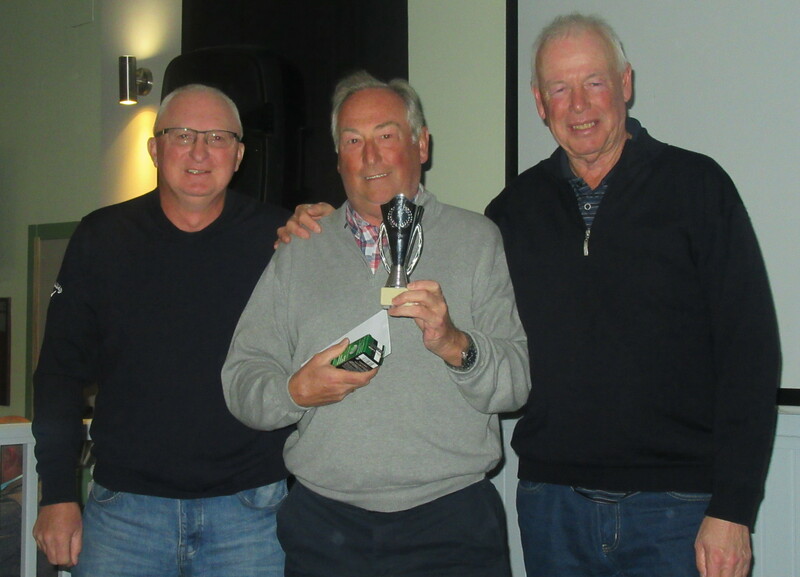 well done Dave, probably the only good score on the day…………..
Ove didn’t need many points to win division 2……. Wednesday February 21st is the deadline for applications for positions on the committee, and any proposals for the AGM. All resolutions and proposals must be proposed and seconded by existing members. These should be sent to the secretary, Kim Lloyd at davelloyd.home@yahoo.co.uk. The AGM is in the Skye Bar, 7pm for 7.30pm Wednesday March 7th. 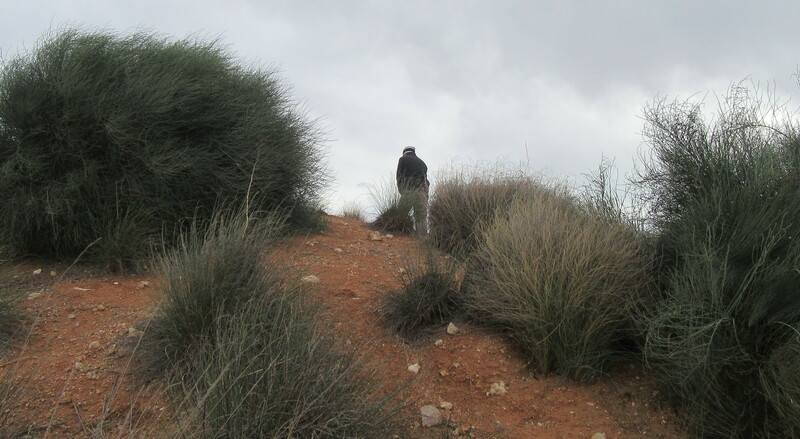 snow on the Sierra Espuna and the Carrascoy…….. 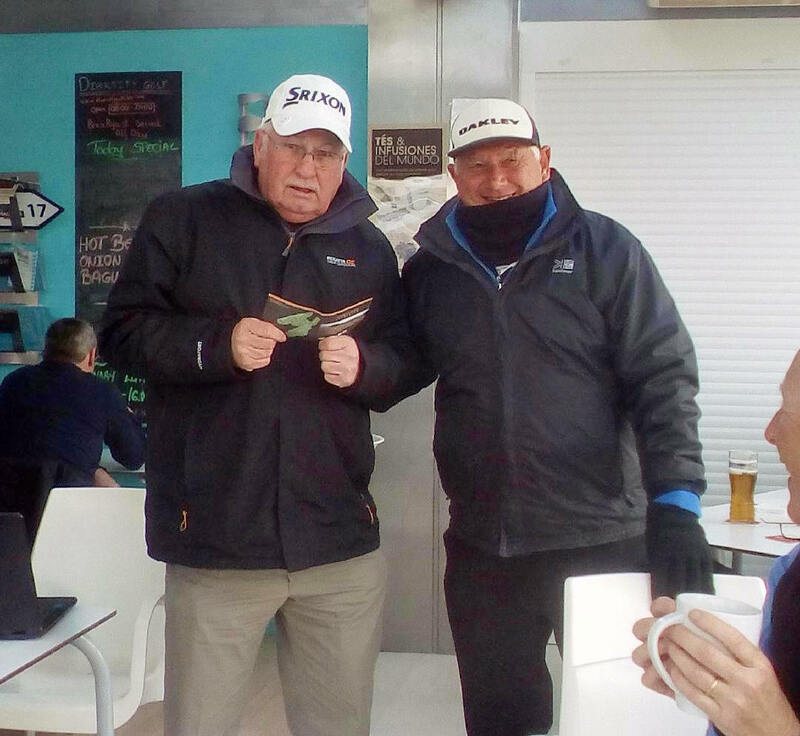 This week saw the 8th celebration of the formation of the golf society, and the competition was played in probably the worst conditions we have had for the February major – the low temperatures were made worse by the wind chill factor. The expected rains came early, (overnight) and if we had rain (or snow) as well, it would have been unplayable. 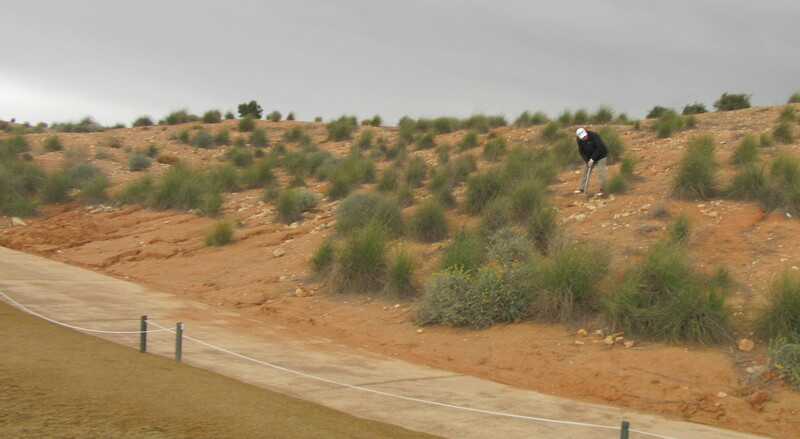 Some of the early golfers had to contend with sleet. It showed how difficult the conditions were when not one of the gents could hit the 350 yard par 4 8th hole in 2 shots to take the nearest to the pin prize – likewise no one hit the 17th green for another nearest the pin……………..
Back in the bar Barry Answer wonders if 23 points will be enough to get in the prizes – it was…………………..
48 players in the pairs betterball stableford with partners being chosen, then a random draw for opponents and times. Thanks to Kerry Henry for taking up the starter’s duties for the first time. 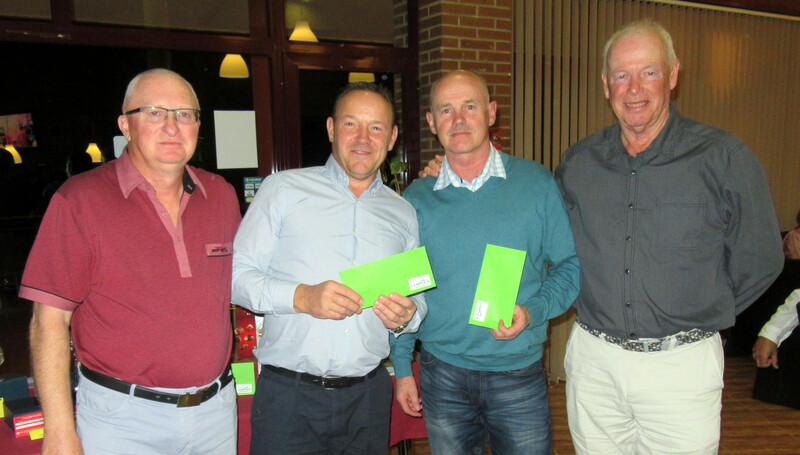 Well done to the winners, Rob Busby (last year’s winner) and Stephen Bell who posted an uncatchable 41 points with past winners Mick Parsons and Pete Moffat runners-up (again!). Stephen and Rob with the new trophy………. 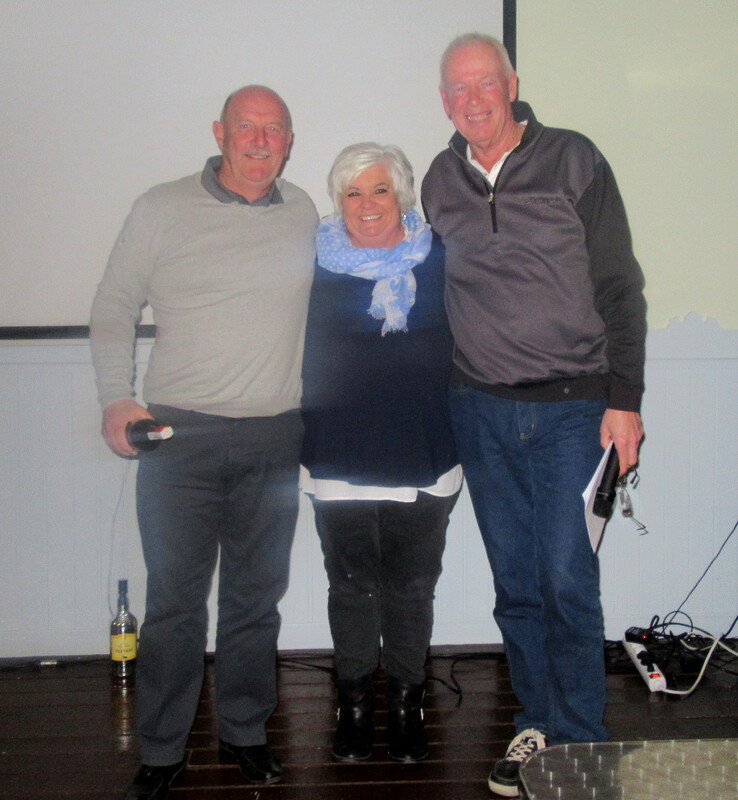 Pete and Mick were 2nd…..
3rd were Jim Laird and Alicia Saunders………..
Pat won the par 5’s…………. the Chuckle Brothers (me and Barry) won the booby prize by a distance! 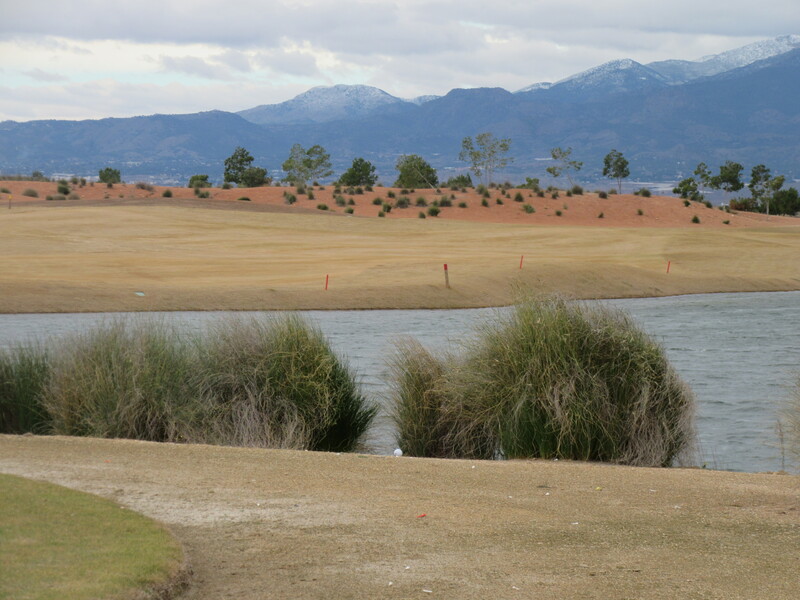 Earlier, Chris waits to hole out in front of the snowy Murcian landscape….. 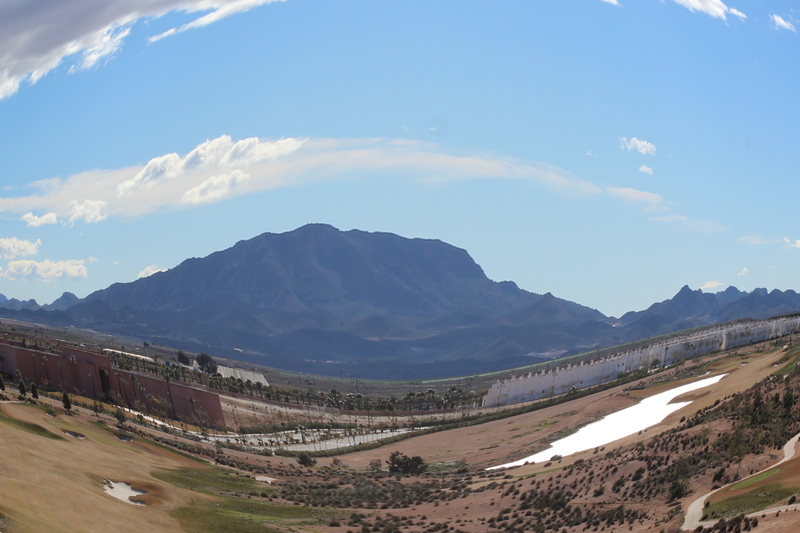 These strange looking clouds look full of something waiting to drop over us………. A fantastic night again at the evening presentation with top entertainment from Mel ‘0’ Dee. 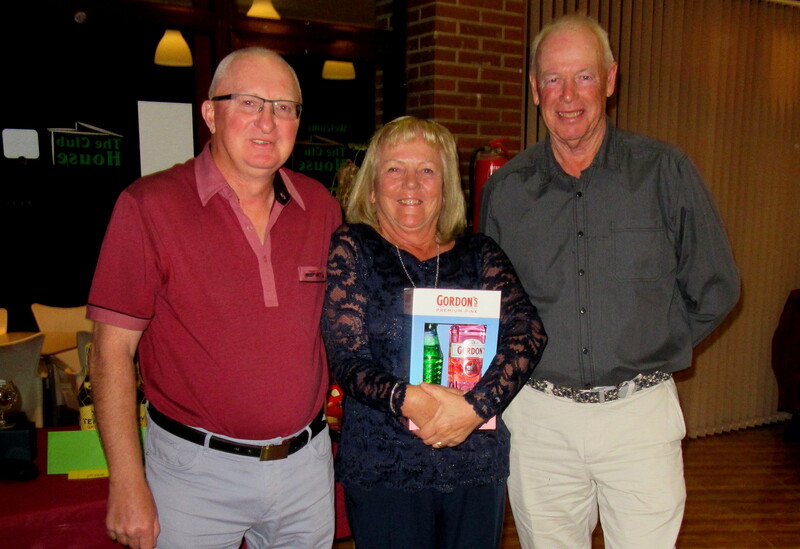 Maybe the lack of heat inside the Camposol golf club spoilt it a little, but as usual the food was excellent. Thanks to the guests who supported the raffle, raising more than enough to cover the cost of the bus provided free from the social fund (sorry to those who had to make their own way). Thanks to Alicia and Kim once again for all their hard work organising, getting trophies etc. – the new trophy for the winners looked stunning! Please note that for the competitions on Monday 5th and Wednesday 7th, the tee times commence at 0903 hours. Will all members who have booked for these two competitions please note their tee time change. These are the times for summer. Next week is the Captain v Presidents challenge.